'Cubics-Blender' is a nifty little program that adds comfort and ease to the workflow of CubaseTM and other Steinberg products, such as NuendoTM. Running in the background, it adds several useful keyboard shortcuts, which allow you to resize and relocate windows within the sequencer, quickly organizing them to your liking. Cubics Blender also guarantees that you'll always be able to retrieve a plugin or a window that got lost somewhere off-screen, and provides an efficient way to navigate between editors. it should be affordable for everyone. we trust you to be Awesome and buy it. And you are Awesome, are you not? Have you ever worked on a project, just to suddenly have all its windows change size and position? Well, never again! Press Ctrl-Alt-Up and the active window instantly expands to match your workspace perfectly. This allows maximizing the editor while keeping the possibility to work with other windows on the same screen. Use the Left and Right arrow keys to quickly switch from one editor to the next, and when you're done with a certain window, use Ctrl+Alt+Down to close it down again. The Main Project window will only be minimized, so there's no risk of accidentally losing any of your work. Hold Ctrl+Win+Alt, and use the arrow keys to send the active window to the top, bottom, left or right of the screen, while placing the previous window on the opposite side. Cubics Blender always keeps track of the last two windows you touched, making the rearrangement process effortless, flexible and intuitive. Furthermore, the Split Screen feature will even work with a single editor, giving you free space to place whatever your project may require. All window sizing processes are relative to the current size of your workspace, making Cubics Blender ideal for working with dual monitor setups, or custom windowed modes. It will even take into account the sizing limitations of certain windows, ensuring most efficient and elegant usage of your workspace. 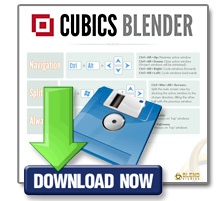 Cubics Blender is also a powerful tool for dealing with windows and plug-ins set to be "Always on Top". At times, plugins may be lost somewhere off-screen, where they can not be moved or accessed by the mouse or other normal means. Cubics Blender solves this kind of problems in a millisecond! Press Ctrl+Alt+PgUp, and just like magic, all missing windows will pop back right at the center of the screen. In other cases, the 'Always on Top' windows may clutter your screen and hide important information on the editor behind them, after they are no longer needed. Using Cubics Blender, you can close them all simply by pressing Ctrl+Alt+PgDown, instantly freeing your screen space once again. ask questions, and to be notified of new updates or news. You're invited to be part of this community! under Windows 7 or Windows XP, 32bit and 64bit alike. Run Setup.EXE to install, repair or remove the software. Microsoft .NET Framework 2.0 or above is required, and it's probably already installed on your machine. If not, the installer will send you to download it from the web. Make sure you have an active internet connection. On rare cases, Administrator permissions may be required. that has no relation to Steinberg Media Technologies. I'm Oded Raz, a professional teacher and the head manager of Blend Studios. I've been teaching and working with Cubase for well over a decade, and thanks to insights gained by years of experience with the software, I decided to implement some of my ideas about optimal workflow in its user interface. Yorye Nathan is a talented young software engineer that made my vision a reality with his skill and brilliance. In the future I wish to directly cooperate with Steinberg and contribute to their success, as I have many more suggestions for further improvement of their fine products. Cubics Blender interacts with Cubase in quite the same way you interact with it, as you use your mouse or keyboard. It is directly communicating with the operating system, sending standard commands that are no different than any manual change you may perform on any window on your screen. No system files are being changed or modified, and there is absolutely no hack into Cubase's source code or drivers. Can Cubics Blender load on startup? and mark the option "Run on Startup". Why do I still see scrollbars after maximizing a window? It is likely that you still have another window somewhere, that's exceeding the available workspace. Use Ctrl+Alt with the Left/Right arrow keys to find it, and choose whether to close it down, or maximize it as well. Can I change Cubase's mixer size? Just like any other window, the Mixer can be resized and moved around, as long as you make sure it is in Window-Mode, and not Always-on-Top. You can freely switch between these two states by right-clicking on the window and checking the AOT option. Can I define my own keyboard shortcuts? Not at this time. We wish to make these a standard. It is possible that you have other background programs that use the same keyboard shortcuts, therefore preventing Cubics Blender from registering them. Check your system tray for suspects. 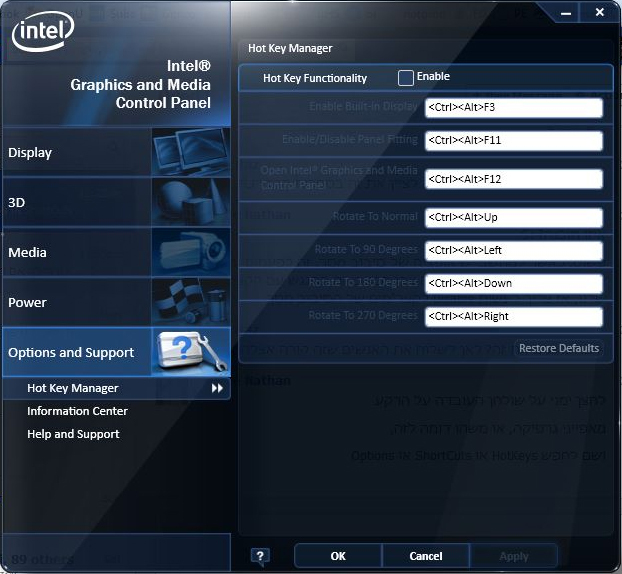 'Team Viewer' and Intel Graphics and Media Control Panel are a good place to start. The program doesn't install or run at all! On rare cases, Administrator permissions may be required. 'Blend Studios' are a training center for excellence in digital sound design. The site is written in Hebrew since we mostly serve Israeli population.